Electrical goods are an integral part of our everyday life, but have we forgotten about the potential dangers they hold? When items are faulty, damaged or left unattended, they become a greater threat to our safety. Each year there are on average 350,000 people who are seriously injured and 70 people killed from electrical accidents in the home. Various organisations (such as Fire Kills and Electrical Safety First) and Fire Rescue Services are getting involved in Electrical Fire Safety Week in order to raise awareness on the electrical fire risks in the home. With more than 20,000 electrical house fires occurring each year, it’s important to understand how to prevent tragedy and remind you how to keep you and your home safe. Over half of us use portable heaters to keep warm in winter as an alternative to turning on the heating. But did you know how risky they are to use? They have caused 73 deaths, 1,000 injuries and over 3,800 fires since 2009/10 and 38% of people leave their heater switched on and unattended! Be sure to keep them away from combustible material and never leave them unattended. Look for the CE safety mark on products, to check they aren’t counterfeit. 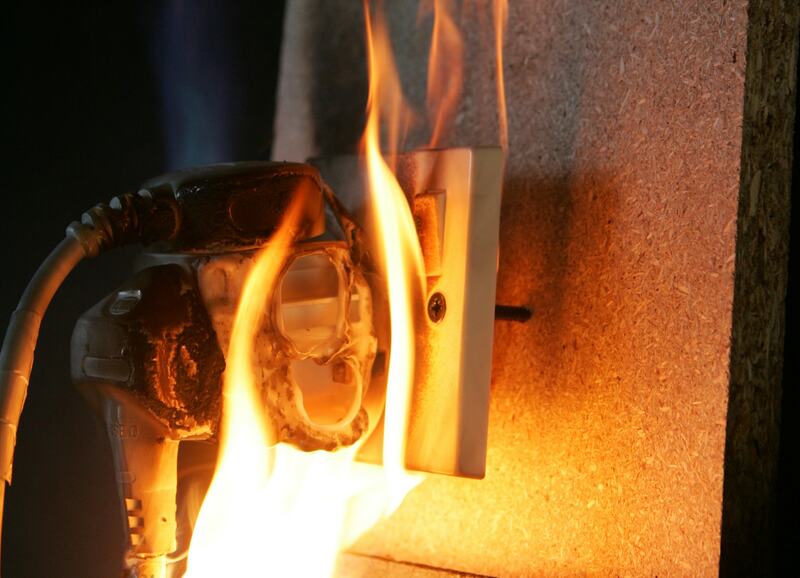 Fake electrical items made from poor quality and cheap components are more likely to not meet the UK safety regulations and you risk electrocution, causing a fire or a fatal injury. Fake phone chargers are one of the most common causes of electrical house fires. Your home should have at least one smoke alarm on every floor. We recommend having them fitted in hallways and in every bedroom. But you must remember to test them monthly! You are four times more likely to die in a fire if you don’t have a smoke alarm that works. Keep an eye out for frayed/damaged cables and if the cable has come away from the plug. Check for scorch marks. Discontinue use if you spot any of these signs. The limit for how many amps an average socket can take is 13; be careful not to overload your sockets. Remember never to attach extension cables to another extension cable; there is only so much it can take before catching fire! You should never leave something charging (phones, laptops, etc) for long periods of time or while you are not in the house, as they can overheat. Do not fall asleep with your phone charging under your pillow, this is extremely dangerous as the phone could overheat and starts a fire under your pillow! Never wrap or allow your cables to bundle up, heat cannot disperse! This is a common fire hazard as many homes have their cables jumbled up, hidden behind something to make rooms appear uncluttered, but the risk still lurks. There are around 65 fires a year which start by faulty electric blankets. If you use an electric blanket, be sure to turn it off before you go to bed and never leave it unattended. When storing, remember to lay them flat or roll, but never fold! If you are a pet owner, take a look at Electrical Safety First’s recent campaign about pets left at home and remember to action the important safety advice in your home! Lastly and most importantly, if an electrical fire breaks out in your home, get out and stay out and remember never to use water on an electrical fire. 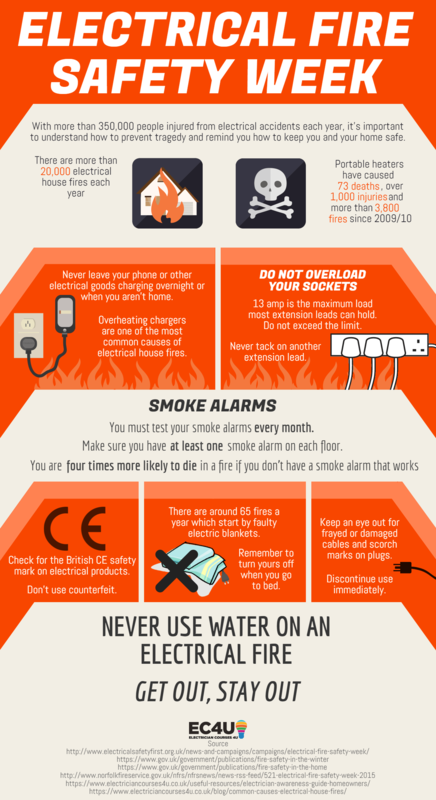 If you enjoyed this electrical fire safety tips, then take a look at these common house fire causes and find out how you can avoid them!